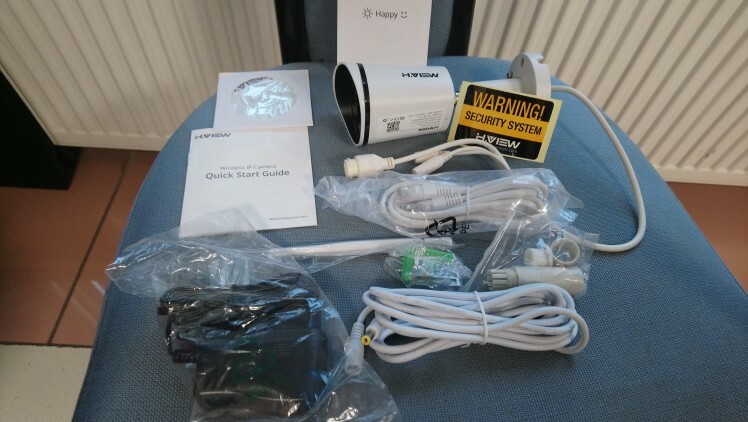 Camera of series-received, connect the wires, download the application and got видеоконтроль with advanced features. All just off set (Full Set-do not buy don't), to use. Even for mobile telephones have Russian interface, with quality translation. The Rest Is THE only has 4 languages: English, German and 2 Chinese. Camera is made with high quality, metal casing, all-weather, degree антивандализма is high enough. There Is A slot for memory card, low power consumption. 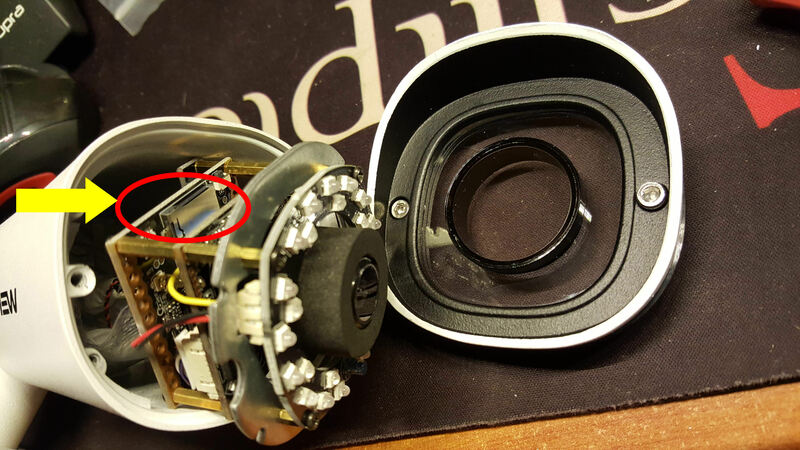 Almost all the manufacturer features implemented in this camera and can be activated and customized in supporting programs. Disk is included, but have left Update-I use downloaded. 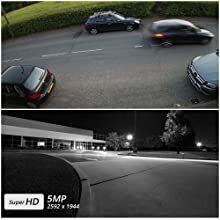 Camera features very extensive, default, not complicating the situation-download the application, activated детекцию motion and get alert mobile with recording on SD card. 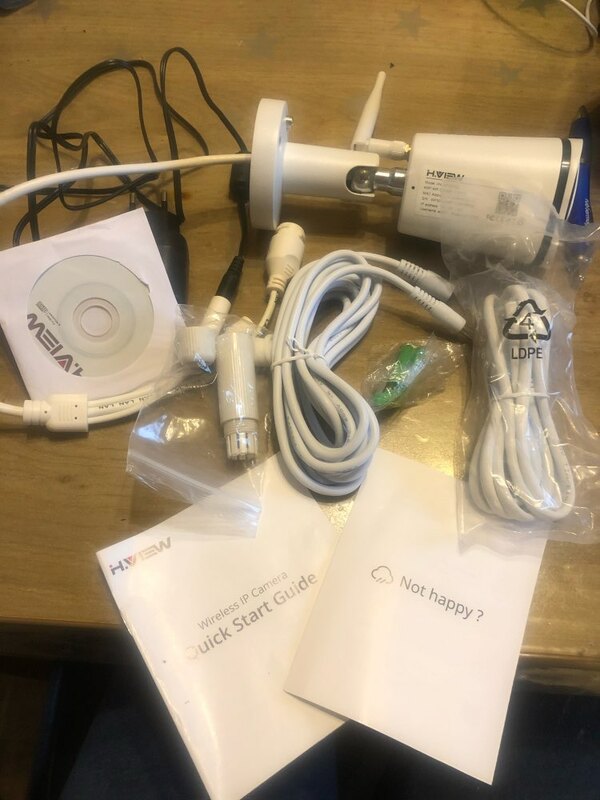 Camera won the freebies, so that the full review looking there. Received shortly. I tested and it is working. No problem. Device and video quality is very good. Thank you. Come in 10 days! 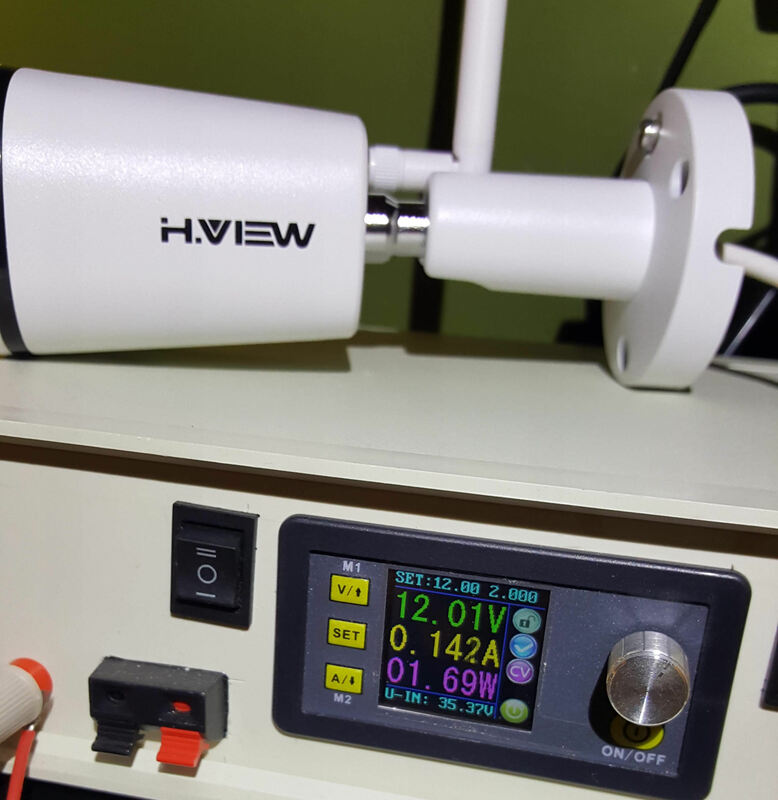 Quality good, weighty is, were included fasteners for camera, Internet cable, extension cable for power cable. Internet application works, but there is one negative. No alert the movement on the phone. If следишь the monitor computer, in online mode, when moving, blinking cool light in the program, but no sound no other alerts No. SORRY. What an amazing quality. No plastics, but iron body! Professional quality. Installation is a piece of cake. Very complete package with extension cords for power, power unit, CAT cable, screws, software. You name it its included. 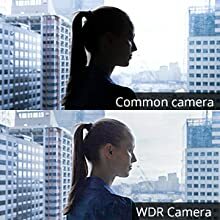 [4.0mp Resolution and 4mm Lens]: Featuring a 4mm lens expand the Coverage to 95° , The 95° viewing angle is best used to cover an entire area at once . 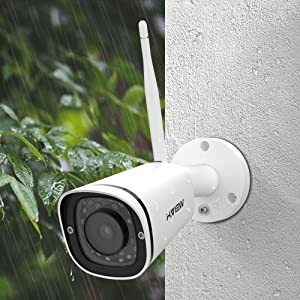 The IP camera delivers HD resolutions up to 2688 x 1520P (4megapixel), bringing sharp and clear images for your residential or commercial applications. 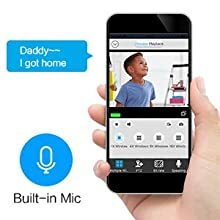 [Built-in Microphone and SD-Card Slot, H.265 Compression] Built-in Audio, Live viewing and playback with sounds. This camera also comes with SD card slot, support Max 128G sd card. 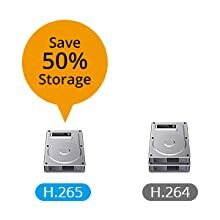 With our H,265 compression technology, 128G sd card can save 15 days recordings. You can also upload videos to FTP server/ NAS etc. 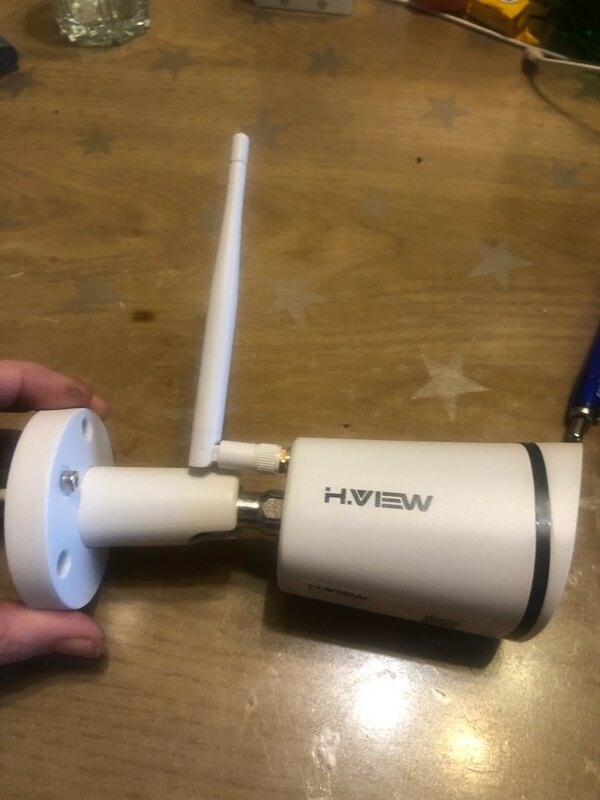 [2.4G/5G WIFI Connection & Neat Installation]: With one dual Mimo antenna and 2.4GHz/5GHz dual bands. 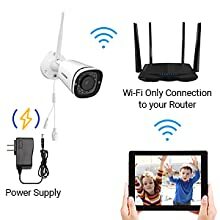 Stable wifi connection for Easy WiFi set-up; You only need connect the plug the camera to your router first then complete all settings. A Stable WiFi signal means you will not lose connection after a period of use. [Onvif Camera.Remote viewing and Snapshot Alarm on Motion Detection ] Come with Onvif and many other private protocols allows the IP camera to be used with a wide range of NVR brands. Live viewing with Mac and Windows, iPhone, Android. 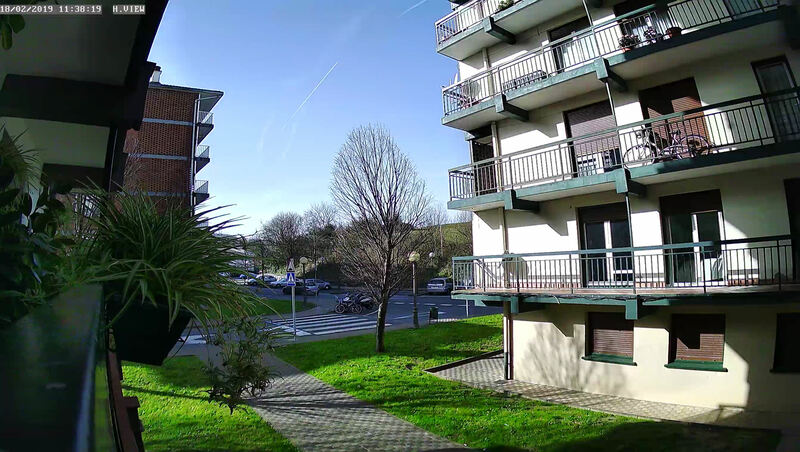 Push Notifications with Snapshot via Email , Automatic Upload to FTP Server on Motion, Alarm. App can only receive Text messages. 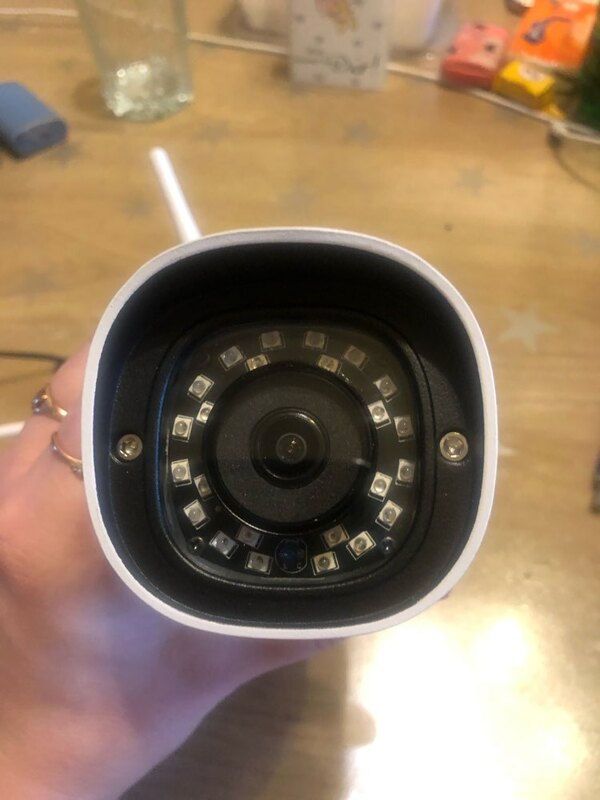 The installation of this camera is incredibly easy . Download Ezvision App from App store or Google Play. 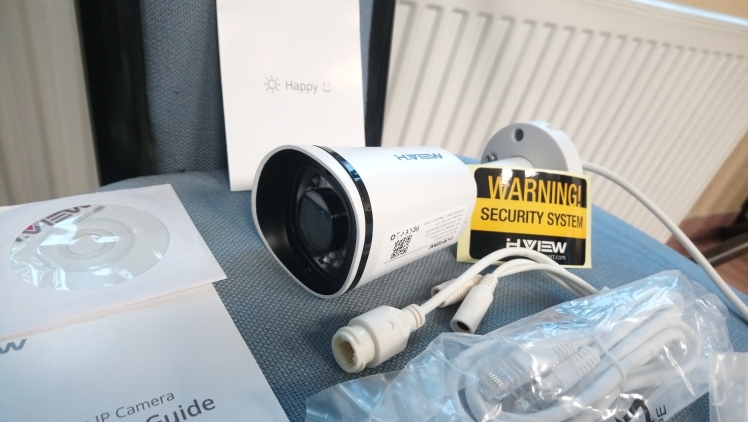 Power the camera on with included power supply, connect the camera to the local network, then you can view the camera with our App or PC software. Camera will work with one power adapter. 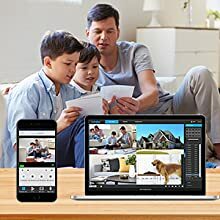 Why Should I Buy A Wireless Camera? No Wires --- The installation of wireless cameras is incredibly easy, allows you to angle the cameras in whatever direction you choose. 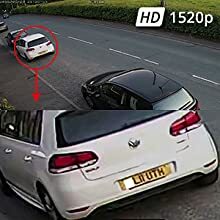 Secured Footage --- Insert a sd Card to save recordings. You can also save recordings to FTP/ NAS/NFS etc. Easy Accessibility---Remotely Viewing with APP and clients. 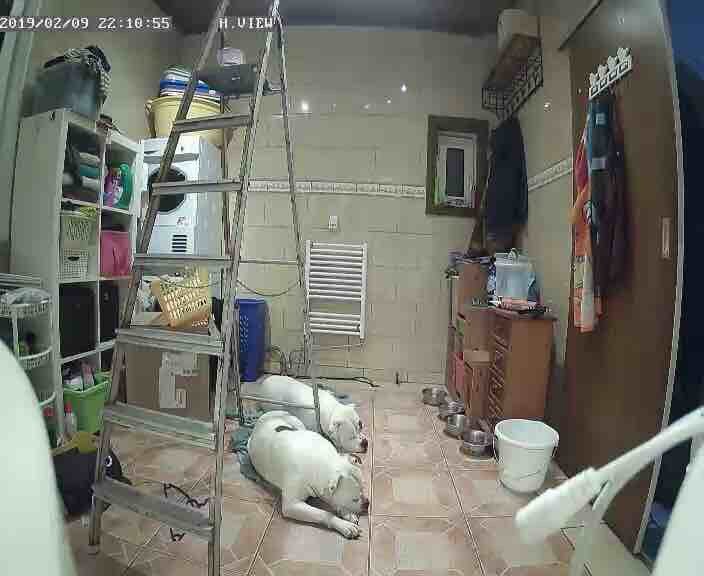 You can view camera anywhere anytime. There are 4 steps to set this Camera up. 1. You need Power the camera with the 12V Power supply which came with package. 2. 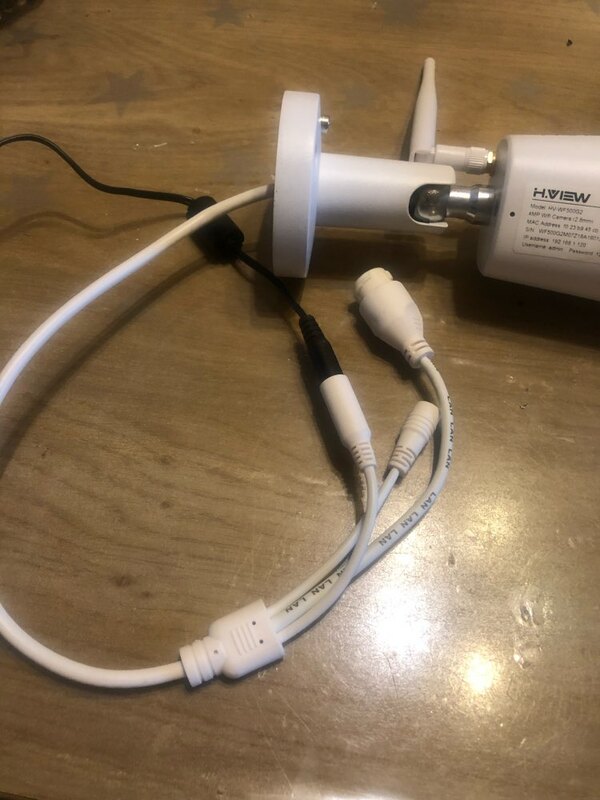 Plug the camera to your router with the ethernet cable to let camera access to your local network (Cable included in the package) 3. Configure the wifi information of your local network. 4. Remove the ethernet cable and download the APP/Client to control the Camera. 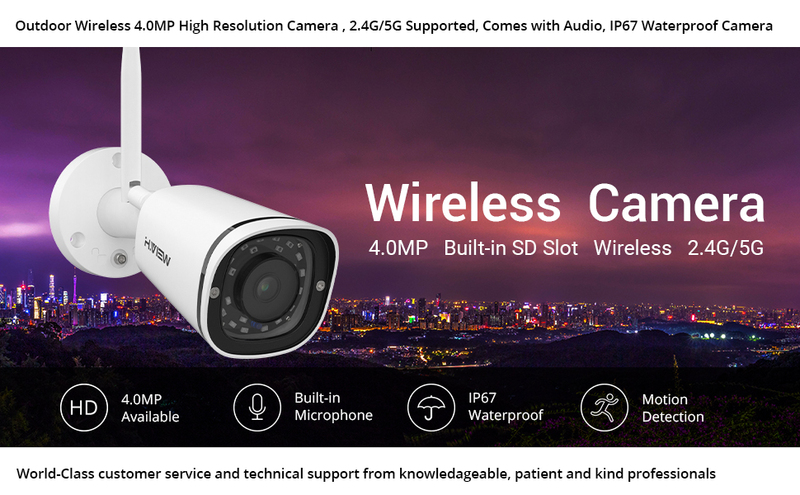 It features our newest 4MP Progressive image sensor with WDR to offer better than other 4MP HD camera. With 24 pcs of high performance LED for crystal night vision, IR distance up to 25 meters. You will be amazed by the clarity this 4MP resolution camera has to offer. A fixed 4mm lens that provides a 95 degrees wide angle of view. 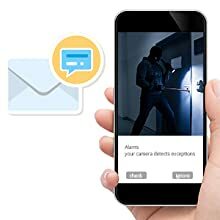 Motion Detection & Smart Alert, Never miss a Important Event .You can set up your camera to email a series of pictures you when motion is detected . Camera will push notifications via APP (Text). It also support capture a series of snapshots and upload those to FTP Server.It can also work with NAS device , you can set your NAS device to save recordings when the motion is detected.